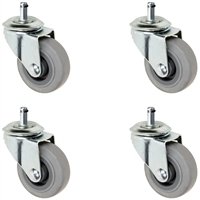 CasterHQ offers Replacement Chair Casters for Dinette Chairs, Displays, and Furniture used on Hardwood Floors including Bamboo floors and expensive flooring that need to be protected from harder wheels that could potentially ruin your floor. CasterHQ offers Replacement Chair Casters for Dinette Chairs, Displays, and Furniture used on Hardwood Floors including Bamboo floors and expensive flooring that need to be protected from harder wheels that could potentially ruin your floor. This page is for our Office Chair Casters with a 7/16" x 7/8" Grip Ring Stem also known as a Friction Ring Stem. 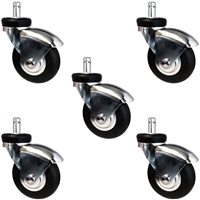 Our Chair Casters are known as a huge upgrade to a standard chair caster because the wheel material is known to protect floors from scratches and marks and are great for most floor types hardwood floors. If you have expensive hardwood floors we would recommend using this Gray Thermo Plastic Rubber wheel which provides a softer cushion ride to avoid scuffing or imprinting on the floors. Our upgraded Gray Non Marring Rubber Chair Casters are constructed out of a high quality engineered thermo plastic rubber allowing it to be resistant to cleaning chemicals, oils, greases, water, and acids. The 2" Gray Rubber Chair Casters can withstand up to 80 lbs per Caster and the 3" Can withstand up to 100 lbs per caster.